The Chiselville Bridge near Arlington can be found just off Route 7A in Arlington. Turn right onto East Arlington Road 1.9 miles to bridge. Dimensions 117 feet long, 11.8 feet wide, 8.7 feet high at truss, 10.9 feet high at center. The 117-foot 1870 Chiselville Bridge was built across the Roaring Branch Brook at a cost of $2,307.31. Located high above the water, Chiselville Bridge, once known as High Bridge, survived the flood of 1927. Many other Vermont covered bridges were not as fortunate. The most intriguing thing about the Chiselville Bridge is the sign, which warns motorists that there is a one dollar fine for driving across the bridge at a speed faster than a walk. 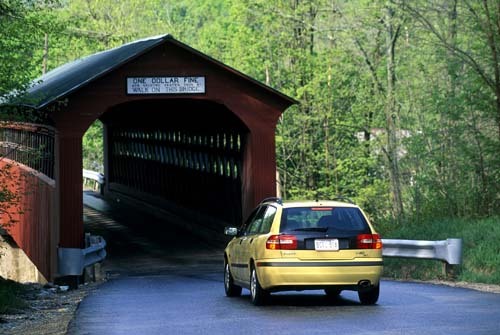 Besides saving a dollar, there’s another good reason to drive slowly if you’re touring Vermont’s covered bridges with someone you love. Covered bridges were once known as “kissing bridges” because they provided a moment of privacy during the days of horse-and-buggy courtships. A covered bridge is a timber-truss bridge with a roof and siding which, in most covered bridges, create an almost complete enclosure. The purpose of the covering is to protect the wooden structural members from the weather. Uncovered wooden bridges have a life span of only 10 to 15 years because of the effects of rain and sun. 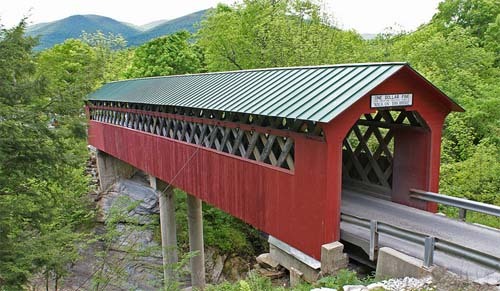 Bridges having covers for reasons other than protecting wood trusses, such as for protecting pedestrians, are also sometimes called covered bridges. Early timber covered bridges consisted of horizontal beams laid on top of piles driven into the riverbed. The problem is that the length between spans is limited by the maximum length of each beam. The development of the timber truss allowed bridges to span greater distances than those with beam-only structures or of arch structures, whether of stone, masonry, or timber. North American covered bridges received much recognition as a result of the success of the novel, The Bridges of Madison County written by Robert James Waller and made into a Hollywood motion picture starring Meryl Streep and Clint Eastwood. 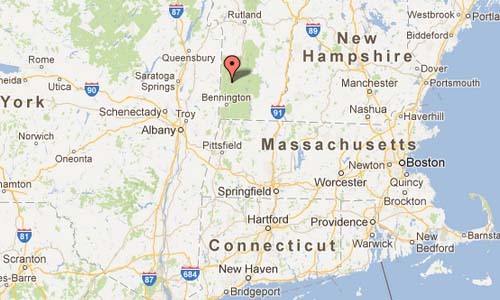 You may pass through all five Bennington County covered bridges in a standard size automobile – one lane only. Bridges were covered to keep the wood dry and thereby avoid rot. This became the trend in 1805 when a bridge designed by Timothy Palmer, an architect, proved most durable. 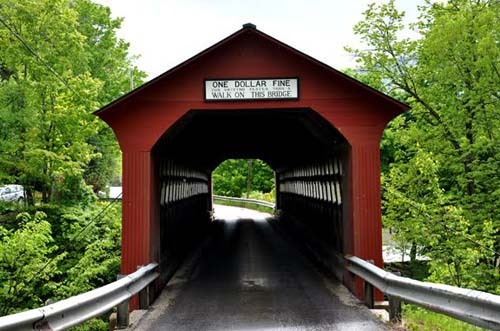 Most covered bridges aare painted red because iron ochre was an inexpensive pigment. Here is an early recipe for bridge paint: 2 qts skim milk, buttermilk or whey; 8 oz newly slaked lime, 6oz oil from ground flaxseed, 2oz turpentine; 1.5lbs pulverized ochre.